I have found my Olympic athlete to watch! The kids and I love Botswana, ever since we hosted two young women for a week in New York from Botswana a month or so ago. Lolo and Rati were beautiful, smart, talented! We became fans of this land-locked country, north of South Africa. And especially the people there. I wrote about our awesome experience hosting these high school musicians at Our High School Students from Botswana. Lolo told us that the whole country of Botswana is rooting for Amantle. They all know her personally as Botswana is small country (almost as big as Texas, according to Google). 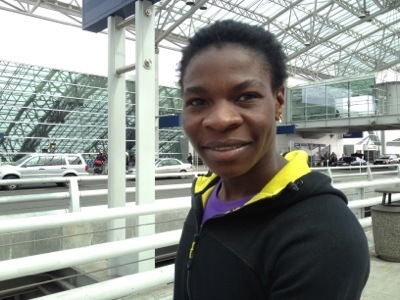 When Amantle walked away from me at the airport, she seemed hardly to touch the ground as she walked. It may be cliche to say, but she was extremely light on her feet. Like a ballet dancer in New York City coming from class, you can tell by the way she walks, she is a special kind of person who really lives in her body. She is lithe and strong. She also seemed quite young and innocent. And I’m rooting for her! Thanks, Joy! I have awesome experiences because I meet and make friends with awesome people – like YOU!